Are the feat revision rules available anywhere else? The site linked seems to be having issues. Edit: Also, are drawbacks allowed? Site is working fine for me. I am not aware of another source for the information. Drawbacks are not in play. Starting Wealth: Average based on class. Very nooby question. Does starting wealth mean the flat gold amount or value of potential equipment as well? Last edited by Hitman3984; 03-20-2019 at 01:08 PM. There is actually an Average Starting Character Wealth amount listed in the Wealth and Money section of the Code Rulebook. Paladin's average is 175 gp. ok so just GP, no equipment. thanks. When you create the character you have the 'average for class' amount of GP to buy equipment for. Ok thanks, that's what I was asking. The value of your equipment and left over GP should equal the average. Hitman - You also get one set of clothes for free, as long as it's worth 10g or less. Sometimes buying general goods can be time consuming. I would recommend checking kits out if this is your first time, they can make it much easier for you if you find yourself spending a lot of time trying to piece together useful items. Do you already have a class concept in mind for the DMPC, or is that something you will decide on after picking the party? My character isn't set in stone. Class will be based on what the accepted players are using. I am leaning toward lizardfolk as of right now but race could also change depending on players. I don't want to put anything up lest an interested person is discouraged from applying because my character is a "fill in the blank" and their idea was too similar. I might add it to the first post after a week or two into applications so that others can start creating connections aboard the Jenivere. Ottiqa is everything you might expect from the lizardfolk, scaled, check. Huge, like six and a half feet, maybe more with great physical strength, check. A menace about him with those sharp pointy teeth and wicked looking claws, also check. There is more to him though for those who take the time to look past the other features. His scales start as black across the length of his spine up to the back of his head than transition to a pale mossy green in the front. He has bony ridges aroundd his eyes and along the top of his head and two small ones on the bottom of his jaw that are symmetrical and pleasing. His eyes are the color of amber, a beautiful hew and his eyes dont have the predatory look one might imagine. He has a few scars here and there from his time in the fights, most noticeable is the marks around his wrist from long hours in too tight manacles. Now and then you will see him rub them or check them as if looking for the missing manacles. Ottiqa is on path, but one that is coming to a fork. Down one path is civilization, Melindra, and perhaps a new life away from the pain and suffering of the last decade, maybe even a chance at love. Down the other path is to revert back fully to wild hunter that he was, take what he needs and hold no regrets for what happens because of it. He is trying to go the civilized route but it is not easy, the temptation to simply kill is strong and sometimes it wins out over Melindra's teachings. Sometimes its even necessary, but he is trying to see things in a different light, trying to understand. He doesn't make friends easily, as in the pits those who he came to be friends with were others he would have to fight and the guards and slavers were more likely to kick him than talk with him. So its a challenge but if you can win past the gruff exterior there is a possible faithful friend beneath. He wants to help, sometimes its to avoid being beaten and to ensure there is food, other times its because its what your supposed to do. He is still finding himself and many things are fluid and a lot of it will depend how the others react to and treat him, which could be interesting. Ottiqa had never planned to be on the Jenivere, or at least hadn't pick that ship specifically for any reason, other than it had been close to the docks when he had escaped. Wounded and confused, he had Stowaway campaign traithidden in the storage hold after climbing the anchor chains, but his immense size and the small hold didn't leave him a whole lot of room to hide and it had only been hours before he was noticed in the hold. Things could have gone badly and it likely that they would have if not for the actions of Thinking one of the other players would be a perfect fit to have stood up for him, gives him an immediate possible connection with groupxxxxxxxx who calmed things down, and allowed Ottiqa to help pay for his passage through a mix of service and the promise of coins at the end. He wasn't entirely sure how he was going to get the coins, as he could only hope Melindra has made it back there or one of her allies might help him, so for now he served putting his immense strength to use shifting things in the hold or doing whatever else the captain and crew needed done. Connections: You should save a spot on your application where you can write in how your character connects with other potential applicants. At game start you will all have met a few times during your time spent on the Jenivere. Just pick two or three other players and write a little blurb about an interaction you had with them. 1) Taken when barely more than a youth by his peoples standards, he remembers them but little more than brief flashes of memory at this point after years of enslavement. 2) He has spent almost a decade as a pit fighter for the Fresh Meat Syndicate, a group of slavers that pit him against man or beats for their spot and pleasure. 3) Melindra of the Vine, a druid rescued him from his enslavement, nursed him back to health and as been working with him to find his place in the world. 1) Ottiqa needs to come to a decision about where he fits in the world, is he the brutual hunting savage that should return to his people, or can he fit into Melindra's world. 2) The interesting challenge for me will be to play a more savage primal character, as its outside my norm and should prove interesting and a chance to grow as a player. 1) Ottiqa is in love with Melindra, she is perhaps the only other who has been kind to him but he doesn't feel like he is worth of her. 2) Fresh Meat Syndicate, have a trace of sorts on him, and invisible mark that only can be seen magically. He doesn't know he is marked, and will be angry when he finds out. 1) The Blackscale Tribe, they are a small tribe, about 30-40 individuals with distinctive markings that he is trying to locate since he was taken. 2) Melindra of the Vine, a druid that rescued him from his enslavement, she has been nothing but kind to him and perhaps the only person he cares about to date. 1) While Melindra has taught him some niceties of society, he is still far from understanding them all and their are bound to be misunderstandings. 2) Ottiqa likes to crack his knuckles, its a habit he doesn't even realize he is doing but its easily noticeable along with the sound. Me'Bra Me'Bra is quiet so its more difficult for Ottiqa to get a feel for her, and he can't tell if his presence unnerves her or not. On the upside there is nothing that stands out as problem between teh two of them so Ottiqa has left her well enough alone. Oodagle Oodagle is amusing to Ottiqa and he generally likes the little blue scaled kobold, I mean she is reptilian and even has similar colored eyes, so he feels some sort of bond with her and unconsciously tends towards sitting near her or around her when he is permitted. Vrazzk Another societal outsider like himself, Ottiqa can relate to Vrazzk's social missteps and it makes him feel a little less self conscious of his own. Also he undersands Vrazzk wanting to be different than his kind and the challenges involved. Segwann Kenir Segwann seems a cheerful enough sort, if a bit odd in his mumblings, but those crew who like to gossip insist he is a good luck charm that would be good to have around. Everybody needs luck. Zangi Blackfall Being a half-orc makes Ottiqa a bit wary given his history with the Fresh Meat Syndicate, she is difficult for Ottiqa to get a read on and he suspects she might turn him into the syndicate for the right amount of coins. Tamba Kongalis Tamba seems different than many of the half-orcs he had met through the syndicate, her friendly demeanor and peacefulness is a welcome change from what he has come to expect from her kind. Her words are crisp and practiced, and seems to have some skill with fire that she can make do her bidding, but it is the tune she hums at times which always catches Ottiqa's attention as it seems so soothing. Aradlon Tandramnar Ottiqa has trouble with the concepts of magic and those that can learn it, Carcerol with his robes and talks of arcane energies doesn't have a great deal in common with Ottiqa, even there experiences as being a slave are widely different. That being said there is nothing wrong with Carcerol they just don't have much in common. Glabrous Wanderer Glabrous Wanderer is unique, something he has never seen nor encountered before making her somewhat of a curiosity to him, instinctively he has some trust in her as a druid as her nature appears good and he suspects she woudl have gotten along well with Melindra. Casey Morgan Casey stands out to Ottiqa as a warrior with his more impressive size and the blade he carries openly, but by the same token he has been nothing but friendly on the journey so far. Charismatic and kind others seem to respond well to Casey so Ottiqa has followed suit and has talked with him on a few occasions when the opportunities have presented themselves. Zizzle Fizzlemender Zizzle and Ottiqa had little enough in common, they talked once or twice on herbs and other natural world discussions, but when Ottiqa lacked the same enthusiasm that Zizzle did their conversations have lapsed. Ottiqa pointedly refuses to take any food or drink from Zizzle after smelling something off one time, for while the gnome does not appear dangerous he remembers their discussion about animal poisons well enough and is cautious. Last edited by OneDarkness; 03-28-2019 at 06:35 PM. I have started adding Ottiqa's basic opinions of others to try and get a feel for things but i am definitely open to changes or further discussions around his opinions. So are based on what info is available and i'll go through and check characters again later to see if details have changed that might change his opinions as well. @Talanna I'd say Oodagle is about done! If you are doing reviews, I'd love one! Short of a player connection or two(added one to reflect Ottiqa) I'd say Casey is done as well. Riev is not a particularly imposing figure; he stands about 5'8", with narrow shoulders, messy brown hair, and dull gray eyes. This impression is reinforced by his coarse, tattered clothes--a sun-bleached shirt that stops just short of his elbows, and dark trousers that reach just past his knees. But a closer glance reveals tough, wiry muscle built onto his slender frame, and he moves with grace and purpose. His hand rarely strays far from the weapons sheathed at his hip--two curved swords, one long and thin, the other short and broad, both unadorned and distinctly business-like. There is one concession to aesthetics that stands out on Riev's otherwise drab and shabby person: a square of red cloth, slightly faded but still quite a bit brighter than the rest of his garb. Riev most commonly wears this tied around his wrist or upper arm, but may tie it around his forehead or over his hair. At times he'll tuck it into his belt or pocket. Riev tends to come across as listless and perpetually tired. He's not shy about speaking up when there's business to discuss, but when it comes to social or personal matters, he tends not to ask questions and his replies are terse and uninformative. Riev can be quite gloomy, confident that the woes of the world are unavoidable for all but the most exceptional heroes. The only way to soften the blows is to roll with them. Riev is weary of seeing people hurt needlessly, fighting back against a fate they can't change. He's quick to encourage others to give up, to endure their circumstances rather than taking the risk to fight them. Despite his words, Riev's actions tell a different story. In moments of crisis, Riev is quick to throw himself into harm's way, heedless of his own life when others are in danger. Why/When: Riev boarded the Jenivere at the Shackles, at the behest of his captain. He was sent to Sargava to look after the captain's "business interests" there, but was also advised to scout out some of the jungle ruins and see if there was any treasure worth sending a larger force to retrieve. It was the third day since they had set off from the Shackles, and it was raining. Riev found it rather refreshing, for the moment; the fresh water falling from the sky was more pleasant than the salt water sprayed up from the sea, at least. There were thick clouds in the distance, and the occasional rumble of thunder, but the navigator predicted that storm wouldn't cross their path. They had taken a few precautions, just in case--making sure everything was tied tightly, that none of the ship's moving parts were jammed or damaged--but Riev was inclined to trust in the expertise of the more experienced sailors. He wasn't worried. But someone else was, it seemed. Riev couldn't help but notice the bright blue lizard-person standing at the starboard bow, clenching the railing tightly, staring at the clouds with wide, wary eyes. She flinched with every rumble of distant thunder. Riev had done his best not to bother or burden anyone on this trip so far, keeping his head down, keeping to business, but when confronted with someone so small and so scared, he felt as though he had to do something. So he approached, and cleared his throat--the kobold started, head whipping around towards him. "The storm's not headed this way," he said, trying his best to be reassuring. Should he crouch down, to be less imposing? Would that be condescending? "We're just on the very edge of it." The kobold nodded slowly, nervous eyes still fixed on Riev, until suddenly she glanced out over the bow of the boat. Curious, Riev turned to see what she was looking out, but saw nothing. The moment she was out of his field of vision, though, he heard a skittering sound, and when he turned back the kobold was gone. Riev suddenly felt very heavy, very tired; he sighed quietly as his shoulder slumped. "Okay. That's fair." Riev stood with his back against the wooden wall outside the captain's cabin, where hopefully he would be out of everyone's way. He had just swabbed the deck, having paid in trade for his passage to Sargava, and his shoulders were still sore from the work. But, he wasn't merely resting; he was carefully sharpening his blade with a whetstone. Tiny sparks fell where the steel scraped against the stone, but he wasn't worried about them starting a fire, as they sizzled out instantly on the wave-splashed wood of the boat. Until they didn't; the sparks began to stop and float in mid-air, just before hitting the deck. Riev didn't notice, until the sparks from several strokes had accumulated. As he stared, trying to figure out what was happening, the tiny motes of orange light began to rearrange themselves. They formed a few curved lines--a simple picture, not detailed but remarkably suggestive. In case there was any doubt what part of the anatomy they were meant to represent, they danced around the blade of the sword, moving in formation up and down its length. "Uh. Um..." That was about as cohesive a thought as Riev could put together before he was startled by a stifled giggle. His head jerked back, up, and he shook it like an animal suddenly confronted by a foul scent, before turning to look towards the source of the noise. By that point, though, he could only catch the tail end of a yellow and black sash retreating. His mouth flapped open and closed with confusion for a few moments before he could rally any words. "I. What." 1) When Riev was young, he dreamed of being a heroic warrior. His enthusiastic pursuit of these dreams led him to a group of youths several years older than himself, who sought to become soldiers, knights, or paladins. 2) As he trained with this group, learning to fight became less and less the point; the dilligence and discipline with which he pursued his skills became its own reward, a source of self-esteem. 3) After a few years, members of the group began to leave one by one as they joined the army, became squires, etc; eventually Riev was left alone. He discovered that he couldn't motivate himself to train without the group's encouragement, and he grew ashamed of himself. 4) At sixteen, though he was somewhat out of practice and uncertain he was worthy, Riev was accepted as a new recruit to the Knights of Ozem. He was en route to Vigil when the ship he had boarded was attacked by pirates of the Shackles. He could do little to fend them off, cementing his feelings of inadequacy, and was captured along with several others. 5) Riev was press-ganged into service in the pirates' crew, and offered them little resistance. He feels that since he's not good enough to be a hero, he may as well play the villain. 6) Riev is not quite as lost as he may appear; when danger strikes, his first impulse is still to protect those around him, and he often acts on it before even realizing what he is doing. 2) Riev hopes to ensure that, when his captain inevitably gets what he wants, he will do so with as little harm to others as possible. 3) I hope to see Riev find his way back to a hero's path, and ideally come to a point where he must stand up to, or at least turn his back on, his captain and the other pirates. 4) This is a little more specific but I would love for Riev to learn that he doesn't have to do something by himself for it to "count"; that needing others' help doesn't invalidate his own efforts and contirbutions. 1) When Riev was first captured by pirates, he managed to convince them that he had no living relatives to extract ransom from; in fact, his fathers and sister are alive and well in Varisia. 2) Although Riev doesn't know it, a member of his old training group is already in Sargava, offering her assistance to the Mwangi natives. 1) Riev's captain, Deluard Glasbier, is a Free Captain of the Shackles. He is a ruthless, dangerous man, but is not without his own sort of honor. He abhors violence for the sake of violence, and prides himself on being a man you can take at his word. 2) Alden Brundt is Glasbier's foreman. Most of the time, Riev answers to him rather than directly to the Captain. He mostly sees Riev as a nuisance, an untrained hand dumped at his feet once they found out there was no one to pay his ransom; Brundt would have preferred they dump the boy at the nearest port, if not toss him immediately overboard. 3) Euphemillia Gaetullus, more often known by the nickname Tully, was the unofficial leader of the training group Riev belonged to in his youth. She was also among the first to leave. Now a paladin of the Silver Crusade, she is in Sargava, helping the Mwangi natives. Although she has not seen Riev since he was twelve, she would likely recognize him still. 1) Riev remembers a day a few weeks after he joined his training group, when he was struggling with pushups. The first of the older kids to finish his own workout came to Riev's side and held the back of his belt--not pulling him up, but not letting him fall either when it seemed like his arms might give out. 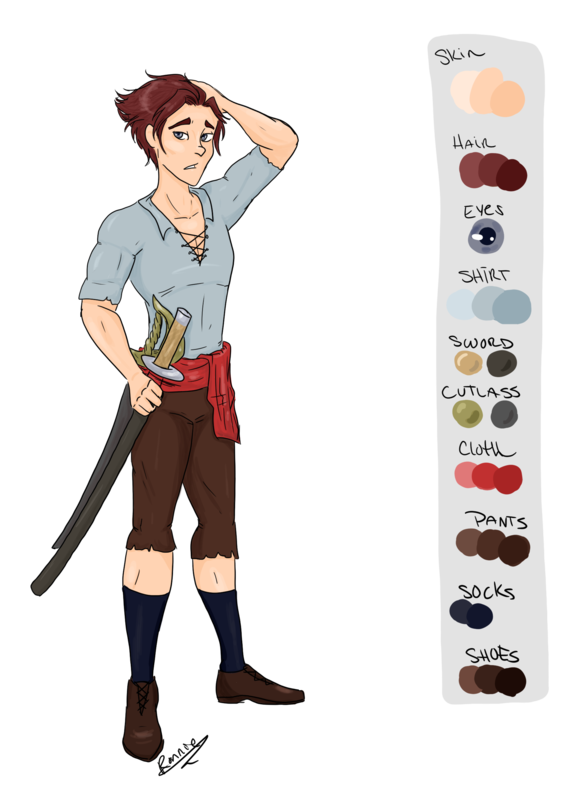 3) Riev remembers his ship being boarded by pirates. He remembers taking up a weapon and charging one of the brigands. He doesn't remember the fight, really, just a blur of motion and the pain of a knee in his gut. It was over before it began. Updated my custom pathfinder races for my Ascana setting to version 3.0, would love thoughts, suggestions, and constructive criticism!